From the producers of "The Outer Limits" comes this provocative science-fiction series about an ancient order dedicated to battling the evil forces that seek a foothold in the modern world. Nominated for science-fiction's top honors, the Gemini and Saturn Awards, this riveting series, based on the legendary Poltergeist film franchise, is an addictive cult classic full of occult thrills! A handsome psychic, Dr. Derek Rayne (Derek de Lint..
“They’re here,” playful at first…but not for long. A storm erupts, a tree attacks and little Carol Anne Freeling is whisked into a spectral void. As her family confronts horrors galore, something else is here too: a new benchmark in Hollywood ghost stories. Producers Steven Spielberg and Frank Marshall and director Tobe Hooper head the elite scream team of this classic chiller. Welcome to Home Sweet Haunted Home.Special Features New D..
“They’re here,” playful at first…but not for long. A storm erupts, a tree attacks and little Carol Anne Freeling is whisked into a spectral void. As her family confronts horrors galore, something else is here too: a new benchmark in Hollywood ghost stories. Producers Steven Spielberg and Frank Marshall and director Tobe Hooper head the elite scream team of this classic. Welcome to Home Sweet Haunted Home.Special Features They Are Here..
From legendary filmmaker Sam Raimi (Spider-Man, The Evil Dead) and director Gil Kenan (Monster House) comes this thrilling film starring Sam Rockwell and Rosemarie DeWitt. After the Bowen family moves into a seemingly perfect suburban home, sinister spirits begin to haunt them. And when the terrifying apparitions abduct Maddy (Kennedi Clements), their youngest daughter, the Bowens must find a way to rescue her - or they'll lose her fore.. The sinister, supernatural forces return in this heart-pounding, otherworldly thriller filled with "jolting, state-of-the-art special effects" (Leonard Maltin). The Freeling family (JoBeth Williams, Craig T. Nelson, Heather O'Rourke) settles into a new home following the annihilation of their former residence by terrifying visitors from the netherworld. But the spirits of the dead are still hell-bent on luring the family's clairvoyant d.. They're baaaaack! The ghastly ghosts and edge-of-your-seat suspense that made you cringe and cower in the original return in this heart-pounding other-worldly sequel filled with jolting, state-of-the-art special effects. The Freeling family (JoBeth Williams, Craig T. Nelson, Heather O'Rourke) may have settled into a new home... but the spirts of the dead have not given up their desire to possess Carol Anne. Led by Kane (Julian Beck), a ..
"They're baaaaack"... again! 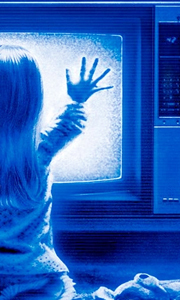 And they're looking for Carol Anne (Heather O'Rourke) in this riveting and climatic finale to the Poltergeist trilogy. Sent by her parents to live in a Chicago high-rise with her aunt (Nancy Allen, Robocop) and uncle (Tom Skerritt, Alien and Top Gun), Carol Anne discovers she must now face demons more frightening than ever before. Led by the Reverend Kane (Nathan Davis), the spirits have moved from invading ..